A Bad Black Friday for Bezos! Following the decision by Amazon workers in the UK and across Europe to take industrial action on Black Friday, the busiest retail day of the year, you have to wonder if Jeff Bezos is starting to regret his approach to working conditions across the Amazon warehouse network. Complaints by staff about working conditions is nothing new, yet Bezos, who’s net worth is estimated today at $125.8 billion, would appear to be ignoring their concerns. In a worrying parallel to the workhouses and factories of the 19th Century, it seems that Bezos is content to ignore his employees concerns and focus on maximising his own profits. The stark divide between Bezos and his workers is clear when comparisons are made. Based on Bezos’s earnings from October 2017 to September 2018 we have calculated that the average worker in the UK (on an average salary of £28,600) would take 1.6 million years to earn the same amount that Bezos has earned within one year. Best case scenario, the average worker in London would take 1.2 million years. To put it another way, last year Bezos earnt on average $2,705 per second. (If you would like this broken down by UK region we have created an interactive bar chart – link in notes to Editor). 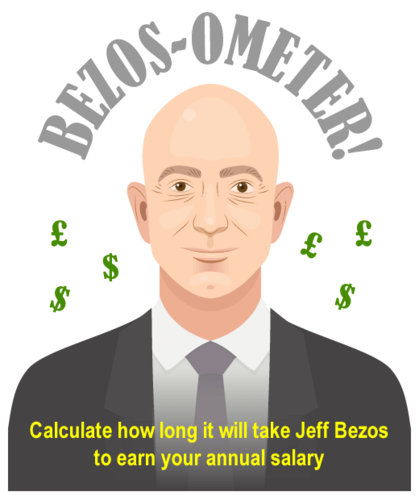 To demonstrate Bezos’ colossal wealth, we have created an easy-to-use calculator that will work out exactly how long it would take Bezos to earn your annual salary. You simply have to enter your salary (in pounds or dollars) and the calculator will instantly tell you how many seconds it would take for Bezos to earn the same. We have also included a live counter which tells you how much Bezos has earned since you’ve been on the page! Bezos clearly has the resources to make immediate and massive improvements to the working conditions of his staff. However his continuing lack of action suggests that this is not his priority. Maybe today’s events and any subsequent impact on profits may make him think again. This press release was distributed by ResponseSource Press Release Wire on behalf of KIS Finance in the following categories: Business & Finance, Education & Human Resources, Retail & Fashion, for more information visit https://pressreleasewire.responsesource.com/about.